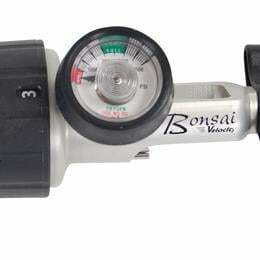 The Bonsai Velocity is the most efficient pneumatic conserver on the market, enjoying more liter flow equivalencies, continuous flow settings, and a higher savings ratio than the competition. As measured between 20 to 35 BPM (Breaths Per Minute), the Bonsai Velocity has an oxygen concentration of 0.8% to 2.0% higher than that of the EasyPulse5, on average. The Bonsai Velocity's decreased delivery time increases oxygen concentration provided to the patient, thus increases the ability to better maintain patient saturation levels, all while maintaining up to a 6:1 conservation ratio.